Walking around my own garden at the moment I am seeing lots of changes to the growth of my plants. However, I have to be honest and say if it wasn’t for this online diary I suspect I would miss much of this early new growth. Taking part with Bloom Day posts definitely has made me much more aware of the seasonal changes. 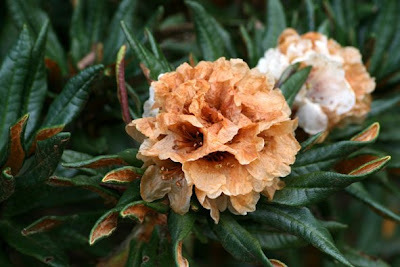 Garden visits are another way the see garden plants through the seasons. 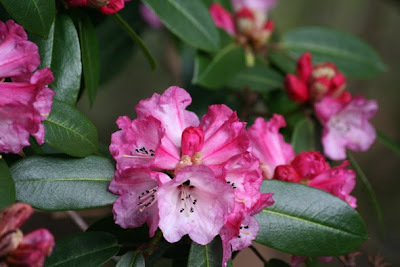 Dawyck Botanic Garden is 8 miles southwest of Peebles in the Scottish Borders. Two weekends ago I spent a very pleasant walk around this garden. Yes, gardens are for seeing plants but I do enjoy the wander along and off the paths and this garden was able to provide both. After discovering lots of birds on my visit my visit to the Royal Botanical Gardens in Edinburgh I took my camera. Nuthatches were to be seen in a particular area and as I have never seen one the route we planned went to this area first. It looked like it could rain so after a quick coffee in the newly opened coffee shop we headed out. Deep red rhododendron buds were the first to catch my eye followed by the yellow skunk cabbage along the edge of a small stream. What a striking sight the skunk cabbage was. Yellow would definitely be the colour I would now associate with this garden in April. Drifts and clumps of daffodils were to be seen all around this garden especially in the woodland area where we headed to spot nuthatches. Pheasants were the birds of this visit and you can see how well they blend with a woodland setting. Sadly they were also seen on and at the side of the road. Even though they can fly for some reason they decide to walk across busy roads! It wasn’t just pheasants we saw at the side of the roads on our drive to this garden. Rows and rows of daffodils could be seen on the grass verges. I honestly don’t think I have ever seen so many daffodils planted in this way. Stone pots and urns are seen in many gardens but I have to say that I find them just as beautiful empty all covered in moss. A small chapel which added further character to this garden. Of course a visit here in the summer would be quite different again although I do enjoy seeing the ‘bones’ of the garden at this time of year. I don’t suppose I would have spotted the ferns growing on the huge branches of this tree if it was in leaf. Looking to the ground native primroses were scattered around. I do love the primrose and the ones in my garden are getting more flowers by the day. I was also taken by the delicate flowers of Erythronium growing through grass. What lovely speckled foliage it has too. I think I might like to add this to my garden for next spring. 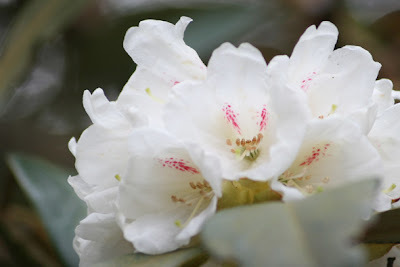 My garden does have small rhododendrons but this garden had quite a range of full sized ones in quite a few stages of flower as you can see in my plantphotos blog. 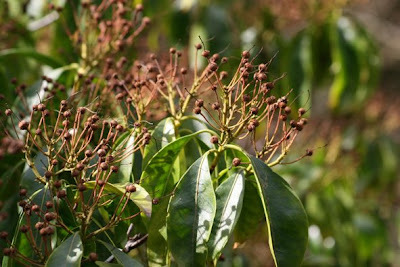 It is difficult to stop taking photos of the different clusters of flowers this plant has. So, I didn’t get the nuthatch photos I set out for but the rain stayed away and we had a very pleasant walk. Update April 30th: I am guessing that perhaps links to my extra photo blogs aren't often followed so I have decided to update this posting with these photos here too as they really capture the character of the rhododendron flower on my visit and it would be a shame if you missed them. 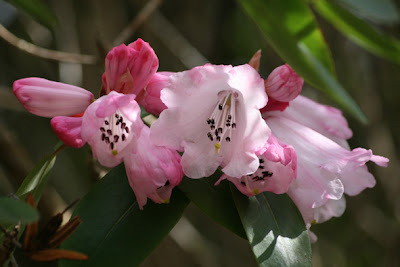 I am sure you will agree that they are quite beautiful flowers especially in a mature garden or a woodland setting. My reason for using the extra blogs is simply as an overflow for photos so that I don't have too many on postings which may make my blog taken longer to load on your browser. That is one of the reasons I use montages too. Although I do feel the montages also capture an essence that scrolling down through photos cannot. I would appreciate any feedback on this. I do understand that my videos can take time too load too but I hope they are worth the wait. It is tricky sometimes to find the balance and I don't want visitors to be turned off by long and difficult to load postings. I understand completely that browsing blogs or any websites takes time (often late at night) and it should be enjoyable and not frustrating. Happy browsing! 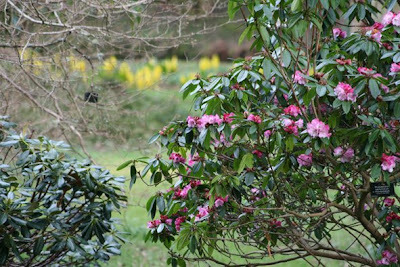 All photos above were taken by me at Dawyck Botanic Garden on April 20th 2008. Hi Shirl, I always am excited when you go on a garden tour. Your commentary and photos are first class. The look of the trees and moss and ferns is my dream of a woodland garden. Thanks for the sharing of your trip. Beautiful mosaics! Thank you for sharing your stroll with us. What beauty Shirl! So wonderful to visit an old garden like that. The moss and the wildflowers are so lovely. Thank you for sharing photos from your walk. Wow I thought ferns grew on trees only in tropical areas. I love that look. Seeing the pheasant running about in a garden is a treat. I think they are such handsome birds. They have been introduced in US and it is fun to come upon them. loved the tour. Erythroniums are really lovely and well worth having in the garden. I do recommend them, particularly as most of them seem easy to grow - always a plus! 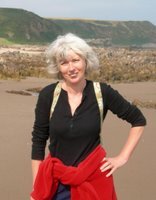 it's amazing reading your blog, then Miranda Bell's in France, really brings home how advanced the north of Europe is rather than in Scotland. Here in the south west this last week has really felt like summer, so great to still see daffodils and ferns in your blog. But did you see the Nuthatch? No problems with loading here. 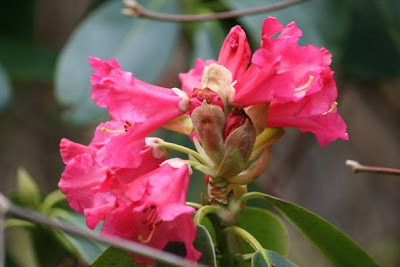 The rhodies photos have gorgeous colours. You've given me another idea for a day out. oops, the Roe Deer and the Hares waer in the fields.. I could just about get one deer in my pocket sized handkerchief before it was full. Seeing your beautiful pictures, I regret very much, that I didn't visit the Botanical Gardens in Edinburgh last May. But now it is on my list for my next visit to Scotland! 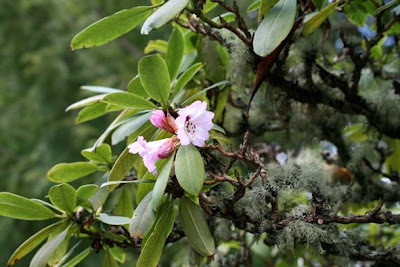 BTW, some of my rhododendrons just start to open their blooms too. What goes on inside a Nestbox?